Cameron Talbott visited Europe in February. 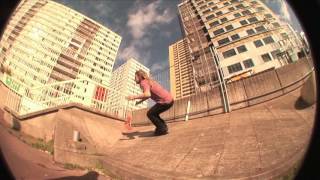 Together with Cavin Brinkman from 035 he stacked his first full Rollerblade® video part. The 30-year-old shredder laced tricks left and right on his Solo Team skates. During some downtime from filming we were able to get in a quick Q&A time. Q. At the end of 2015 you were added to the international Rollerblade® street team. A. My time with Rollerblade® so far has been great. Tom and Erin have been awesome in facilitating travel and making sure I have what I need to get out and have fun skating. Being part of Rollerblade® has also given me opportunities to better myself on and off the blades! Q. 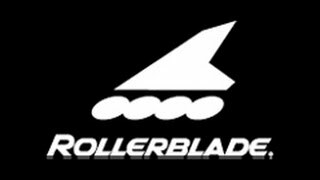 How do you feel representing the brand that originated inline skating, Rollerblade®? Do you think Rollerblade® is a good fit for you as an athlete? A. I'm hyped to be part of RB. I grew up skating RBs and to see them still part of the aggressive scene is really cool. I think ultimately RB understands what skating means to some of us and they are always finding new ways to expose others to the joys of skating as well as push those of us that have done it for so long. I've learned so much about myself, and this wild world we live in, thru skating. It's great to be apart of something that understands that. Q. You have been skating for quite a while, and now you are getting coverage more than ever before. How does this make you feel? A. I'm really just grateful for everything that has happened so far. I've always just skated to have fun and to push myself as an individual and see what's possible. Having people say they enjoy watching my skating is humbling. I just see myself as another skater. HaHa. So to gain more exposure as of late has been a trip to say the least. Q. 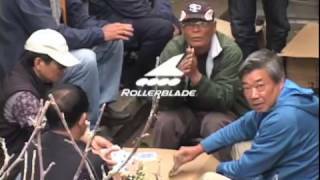 Can you explain your individual style of skating? 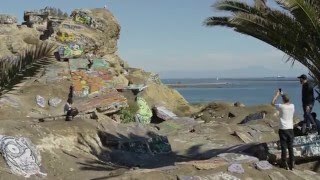 A. I just skate and have fun, I really enjoy exploring new obstacles that make you think about basic tricks differently. I often try to connect the dots in a sense that one trick can be a series of multiple tricks. Making lines where you may not see them at first. Q. What is you biggest motivation to be on skates and where does it come from? A. I think my biggest motivators are my friends. Being with them, and watching them push themselves, only makes me want to do the same. Also, skating new places is exciting and often gives you a new look on some things, Friends and travel are my two biggest motivators. Q. Together with filmmaker Cavin Brinkman you put together a very impressive part. How did you guys end up working together on this video? A. Cavin and I have been talking for a few years about getting together and making something. We just hadn't been able to make it happen until recently. When Tom told me I was headed for Winterclash I immediately thought of presenting an idea of staying an extra week in Europe to film with Cavin. We ended up getting a few nice days while in Paris. It was just enough to get something we are both excited about. Paris has so many amazing spots. We just road bikes from spot to spot, and tried to stay as productive as we could when the weather allowed it. Cavin was a great guide. He knew Paris well, and he knew what spots I would have some fun on. Thanks Cavin! Q. Before you filmed with Cavin in Paris and Amsterdam you attended Winterclash. What is the best experience you will take back home with you? A. That inline skating is alive and well! HaHa. So many people come out for this contest. The unity amongst everyone was an experience of its own. Seeing old faces and meeting new ones was definitely a highlight for me. After years of seeing edits of Winterclash, to finally come experience for myself was great! I hope to make it back! Thanks for the great video part Cameron. We hope to see more from you soon!